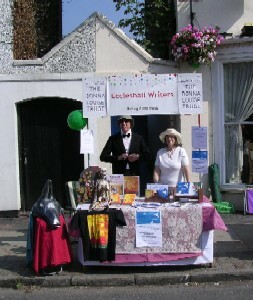 The Eccleshall Festival Street Market last Saturday was great fun. It was a lovely warm day with just enough breeze to keep it from being too hot. Plenty of people visited the street market and came over to the stall to see what was on offer. There was much interest and several copies of “Barking At Nothing” were sold, which is great news for The Donna Louise Trust. The photograph, taken just before the official opening of the event, is of Elizabeth Leaper with fellow local author Bob Stewart who was sharing the stall to sell copies of his gothic teen-fiction book “The Devil’s Creature in the City of the Dead”. Bob was also making a donation to the charity on this occasion. The event was to be fancy dress so please forgive the bow tie and silly hats! So far two out of the three scheduled Book Signing sessions in the Donna Louise Trust Charity shops have been completed. Both sessions, in the Stone shop and the Hanley shop, were good fun, there was much interest and several copies of the book were sold. The photograph here is of Elizabeth signing a book at the Hanley shop. The third scheduled session takes place this coming Saturday, 3rd July in the shop in Leek. We look forward to meeting as many people as possible there and making further sales in support of the Donna Louise Trust. 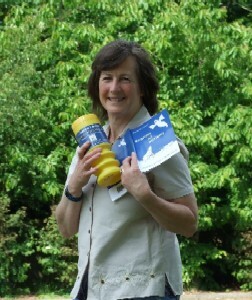 “Barking At Nothing” was launched on 3rd June at “Treetops”, the Donna Louise Trust Hospice in Trentham, Staffordshire. “The Sentinel” Newspaper came along for a photo shoot. Elizabeth will be signing copies of the books at the charity’s shops over the next few weekends. For full details please visit the Events page. We regret the delay in setting up the online payment system. Hopefully this will be available soon. In the meantime please place your orders by emailing us via the Contacts page. We have now taken delivery of our children’s poetry book “Barking At Nothing”. As previously stated all the net profits from the sale of this book will go to The Donna Louise Children’s Hospice Trust based in Staffordshire UK. We are now able to accept pre-publication orders so please email us via our “Contacts” page to place your order. We hope to have an on-line payment scheme in place soon. 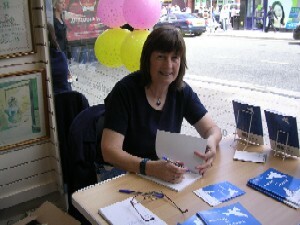 The book will be published on 1st June 2010 and the poet and illustrator, Elizabeth Leaper, will be doing some local signing sessions during the first week in June. We will notify you via these pages and in the local press where and when these events will take place. After checking the first proof copy one or two errors were found and a second proof copy is therefore being prepared. This should be with us shortly and we are still on track to take delivery of the books within the next week or two. I have today received the proof copy of “Barking At Nothing” and I am very impressed with how it looks! I now have to check it thoroughly before going to print. Once this is done and the book is being printed I will post more information on the Books page. The printer has produced a cover for “Barking At Nothing”, based on my design and after some slight alterations this has now been approved. Hopefully a proof copy of the book will be with us shortly. “Barking At Nothing” at the printers. My new collection of fun verse for children entitled “Barking At Nothing” is now at the printers and I am eagerly awaiting the proofs. We are on target to have the book ready by mid-May.